Ted. Birth registered as Edmond James DENNEHY at Timaru. Baptised Edward James. Thereafter Edmund James. Enlisted as Edward DENNY. Height 5 feet 5½ inches. Weight 134 lbs. Chest measurement 36-39 inches. Complexion fair. Eyes brown. Hair dark brown. Eyes both 6/6. Hearing good. Colour vision normal. Limbs well formed. Full and perfect movement of joints. Chest well formed. Heart and lungs normal. Teeth bad - fair. Free from hernia, Varicocele, Varicose veins, haemorrhoids, inveterate or contagious skin disease. Good bodily and mental health (bad teeth otherwise satisfactory). No slight defects. Teeth quite sufficent. Unfit - Fit. No marks of congenital peculiarities or previous diseases. Edmund James Dennehy, born on 23 January 1890 at Timaru, was the second son of Irish-born parents Michael Frederick and Margaret Josephine (Maggie, née Gerity) Dennehy, of Timaru. He was baptized Edward James Dennehy on 9 February 1890 in the Timaru Catholic Parish. Edmund was named for an uncle who also came to New Zealand. His parents had married on 15 October 1884 at the Church of the Sacred Heart, Timaru. Thereafter they resided at Timaru where Mr Dennehy was a clerk and very active in community and church affairs. He presented drama and recitation items; was secretary and treasurer of the newly formed Timaru Handball Club in the mid 1880s, and he also met with success in handball matches; and he was secretary of the Hibernian Society for some years and when Bishop Grimes visited in 1888. He was often called on to perform civic functions – serving on a jury, on an inquest panel, and as returning officer. Throughout the war Mr Dennehy appears to have sought distraction and comfort in lawn bowls. Mrs Dennehy, who was long held in the highest estimation, would often be found playing the church organ or the piano for concerts, as did their daughter Eileen, a talented and highly qualified musician; In 1889 Mrs Dennehy not only accompanied all the singers in the Catholic Boys School concert (a regular practice), she also provided the music for a concert in aid of the building fund of St Mary’s Church, Pleasant Point. Eileen Dennehy, A.T.C.L., arranged and with her sister participated in a most successful concert for the Levels district patriotic festival in July 1915. Miss Dennehy was again to the fore as the accompanist at the concert for patriotic funds held in the Theatre Royal in March 1916. Edmund was educated at the Marist Brothers School and the Timaru High School. At the Marist Brothers entertainment in the Theatre Royal in September 1900, “Masters Houlihan and E. Dennehy delivered their recitations in good style, and had each to respond to an encore, and in comic singing the last-named little fellow and Master Kelly received similar compliments.” Later that year he was one of the first communicants, and at the evening ceremony following, an act of consecration to St. Joseph was read by a little boy – E. Dennehy. In the evening of St Patrick’s Day 1902 a concert was held in the Theatre Royal. Master E. Dennehy took the part of one of the principal characters in a one act play entitled ‘My lord in livery’. “The performers were well up in their parts and were decidedly much above the amateur standard.” On leaving school Edmund attended the Timaru Technical School and worked for a time in the offices of Messrs Perry, Perry and Kinnerney, then joined the NZ Railways. While still in Timaru he participated in hunts. In 1907 he rode Teddy in the hunt held at Mr Grant’s Elloughton Grange, and a few weeks later he rode Benjamin in the South Canterbury Hounds hunt at Mr Orbell’s Levels property. Edmund was a labourer at Hora Hora near Cambridge in 1911 and was one of the soldiers who went away from that area under the command of Lieutenant Dobson on 14 August 1914. At Awapuni Camp the men were trying their marksmanship and there was conspicuous activity in the work of packing such things as harness and other gear for transport, in anticipation of an early departure. Edmund was in this Wellington quota, a Driver in the Field Artillery. Ted, as he was known, actually enlisted as Edward Denny on 14 October 1914 in Wellington where he was living and working as a driver for Shaw Savill & Albion Co. Prior to this he had served for 15 months with the South Canterbury Mounted Rifles. He had been temporarily rejected for service on account of his teeth, but on enlistment, although his teeth were only fair, they were “quite sufficient”. There also seemed initially some doubt as to his fitness. He left on 16 October 1914 with the Wellington Battalion. On 26 December 1914 after arriving at Zeitoun, he was confined to barracks for five days and incurred a fine of 7/6 for being absent without leave and drunkenness. Just a year after enlistment, Ted was killed in action at the Dardanelles – on 6 August 1915 at Cape Helles, at the start of the assault on Sari Bair. In the fresh Casualty List (No. 158) issued on 23 August 1915 he was named as Edward Denny, and was one of seven men killed in action. His father was, however, informed, as his (the father’s) forenames and address as next-of-kin were correct. A “For the Empire’s Cause” notice for 25 year old Edmund James Dennehy was published in the New Zealand Tablet of 2 September 1915. Ted was described as of a bright and amiable disposition and was extremely popular with all with whom he came in contact. He was highly spoken of in letters from the Front. On his death his parents received messages of sympathy from His Excellency the Governor, the Premier, the Hon. W. Massey and the Minister of Defence. His legatee was Mr W. O'Driscoll, of York Street, Timaru. His mother was a stepdaughter of Mr Thomas O'Driscoll, and in 1887 Mr Dennehy and a Mr O'Driscoll went into business together as grocers and general dealers. His mother’s sister, moreover, had married William O’Driscoll in 1884. It was to Mr O'Driscoll that advice re his medals (1914-1915 Star, British War Medal and Victory Medal) was sent in 1921. The plaque and scroll were sent to his father in 1922, in fact after both parents had died. A lapel badge and Gallipoli Medallion were despatched on 24 May 1971 - to whom? A declaration dated 29 June 1920 proved that his correct name was Edmond James Dennehy, rather than Edward Denny under which name he had enlisted, and all his records were amended accordingly. Mr M. F. Dennehy, the father, suffered a severe scalp wound in a nasty cycling accident in September 1918, and required hospital treatment. He was to live on for another three years, predeceased by Mrs Dennehy in 1920. Edmund was a brother of Thomas who was killed in action on 12 October 1917, and of Frederick Michael Dennehy who also served in World War I, leaving in February 1916. Frederick named his twin sons, born in 1921, after his two brothers lost in the war – Edmund James (Ted) and Thomas Francis (Tom). His Excellency the Governor-General, Viscount Jellicoe, opened the Timaru Boys' High School Memorial Library on 21 March 1924. Unfortunately both of Edmund's parents had died before this event, and so they were not on the dais in front of the memorial among the parents of old boys who had died at the war. Perhaps some of his siblings were there. Included in the names above the inscription “Their name liveth for evermore.” on the roll of honour is E. J. Dennehy. After the formal opening, the “Last Post” and “Reveille” and one minute's silence followed, and the hymn, “O God, Our Help in Ages Past”, was sung. Three hundred boys went from the school and 52 did not return. From that date boys have looked with pride at the tablets housed in such a fine building. It was believed to be the only memorial of its kind in the country. 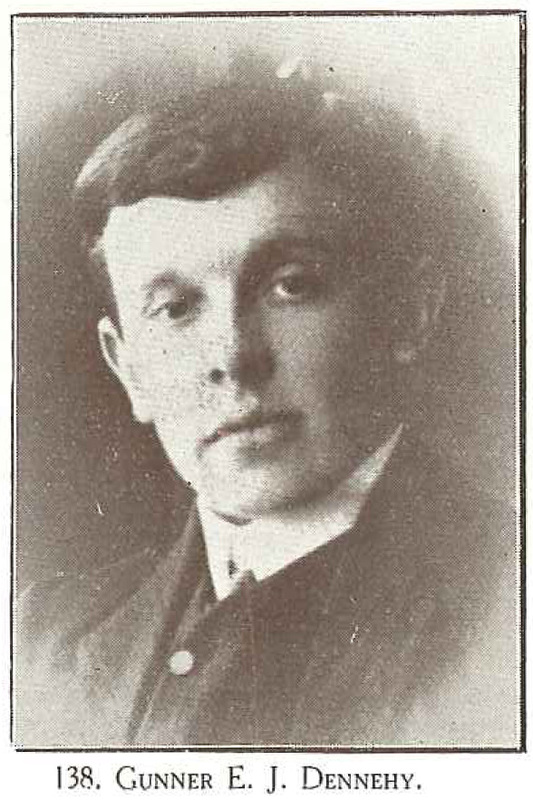 Edmund James Dennehy’s name is inscribed on the Chunuk Bair (New Zealand) Memorial at Gallipoli, as DENNY E., Gunner; and he is remembered on the Timaru Memorial Wall, the Timaru Basilica of the Sacred Heart Memorial and the Timaru Boys’ High School War Memorial (Library). Cenotaph Database [21 July 2013]; NZ Defence Force Personnel Records (Archives NZ Ref. AABK 18805 W5537 0033818) [01 Aug 2013]; CWGC [30 July 2013]; Timaru Herald, 04 November 1884, 26 April 1907, 11 May 1907, 10 July 1915, 25 Aug 1915, 28 August 1915, 27 March 1916, 25 September 1918, New Zealand Tablet, 7 November 1884, 6 September 1900, 20 December 1900, 20 March 1902, 2 September 1915 [x 2], 12 June 1920, 22 & 29 September 1921, 6 October 1921, Ohinemuri Gazette, 14 August 1914, Dominion, 28 August 1914, Evening Post, 24 August 1915, Otago Daily Times, 24 August 1915, Auckland Star, 24 August 1915, Press, 21 March 1924 (Papers Past) [22 November 2013; 06, 08 & 09 May 2015; 19 August 2016; 18 & 19 February 2018]; NZ Electoral Rolls (ancestry.com.au) [06 May 2015]; Baptism Record (Christchurch Catholic Diocese Baptism Index CD, held by S C Branch NZSG) [10 May 2015]; Mountainview High School Roll of Honour project.